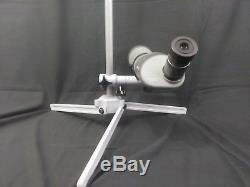 Proven High-power, Small-bore spotting scope stand. Our stands have been use at the state level, regional and the national in Camp Perry Ohio. 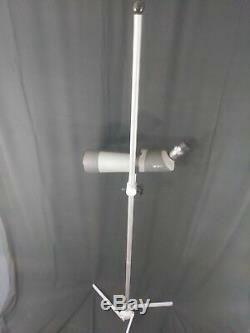 This is our full height 7/8" stand that is 66" tall and the base is 22 wide. The rods unscrew into 3 sections and are 22 long. 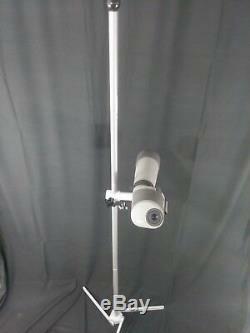 The head rod tension can be adjusted to your preference, from light tension to allow easy adjust to extreme tension so the hole stand will move and not rotate on rods. It is made from military grade aluminum so it is very durable. 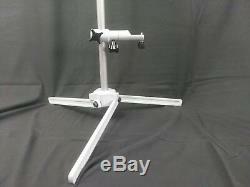 These stand are powder coated in a Gray and White finish. Our scope stand head are designed to work with most spotting scopes and may not need a saddle style head for you spotting scope. We back our product 100% and our company has been in business since 1953. We still have the same customers we started with. Send a message if you are interested in volume discount. 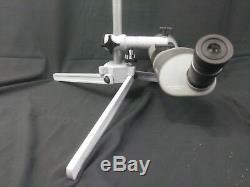 The item "Gray/White Spotting scope stand 7/8 rod. High Power, National Match, High Power" is in sale since Monday, January 28, 2019. 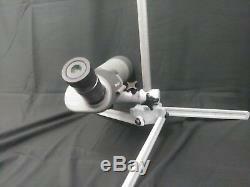 This item is in the category "Sporting Goods\Hunting\Range & Shooting Accessories\Bipods & Monopods". 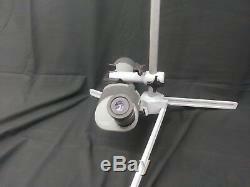 The seller is "chippewafoundry" and is located in Chippewa Falls, Wisconsin. This item can be shipped to United States.